Info "Time the frogs' jumps so they'll land on the vines." Launchpad is one of Kat and Ana's microgames in WarioWare: Twisted! 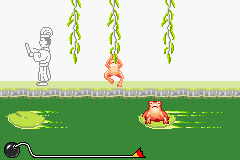 The player controls a frog. They must wait until the frog passes and make it jump at the right timing to grab a vine. If done so, the game is won. However, if one frog gets away, the player loses. 1st level difficulty: There is one frog. 2nd level difficulty: There are two frogs. 3rd level difficulty: There are three frogs. This page was last edited on October 29, 2018, at 21:23.